How do you get kids to cooperate with orthotic wear? How do you make sure the orthosis will stay put on their extremity? And how do you make an orthosis on a child that can’t sit still? Orthotic fabrication for children can be quite challenging for all parties involved. Here are some guidelines to make the process easier for you and your young client. When fabricating orthoses for young patients, you must always consider the age and developmental level of your client. The clinical setting in general may frighten younger children. Prepare a quiet area for splint fabrication without distractions and noise. Let them play quietly or eat a snack while you prepare the pattern and heat up the thermoplastic material. Always explain to the parents and caregivers what you are doing so they are calm as well. Give a small piece of the activated thermoplastic material to the child and parents to handle while you fabricate the orthosis. Let them feel it and play with it. Make an orthosis on their doll or toy so that they have a buddy going through the same process! Enlist the young client’s cooperation with the orthotic wearing schedule by using your knowledge of what appeals to each age group. Everyone is attracted to the bright colors now available in thermoplastic materials and strapping materials. Younger children might like their orthoses to resemble animals, so try giving the splint an actual face! Older teenagers might be tempted by cool bright colors that match their favorite teams or school colors. And everyone likes stickers or jewelry to liven up and individualize their orthosis! Develop the schedule of orthotic wear with the child and family so everyone is well informed. Provide written, verbal and pictorial instructions of the wearing schedule. Create a chart and use stickers as a reward for following the schedule. Label each orthosis clearly when issuing more than one, and make sure to show the child and caregivers how to don and doff each correctly. Numbering straps or color-coding an assortment of orthoses may be helpful. Demonstrate the proper method of orthosis application to the child and family. Take a cell phone picture or a video of this so that there is a record! Give the child a choice in color of materials and/or strappings so that they have a say in the design of the orthosis. Allow the child to do a favorite activity while wearing the orthosis. Use devices typically manufactured for keeping shoelaces tied (Bow Biters). All children grow quickly, so you must monitor the fit of the orthosis frequently. Remember also that all children have unique hands that require custom designs and individualized intervention plans. These guidelines can also be handy when treating patients with mental and/or physical disabilities. More information on orthotic fabrication for kids can be found in the chapter “Orthoses for the Pediatric Population” in a soon- to- be released book on orthotic fabrication, entitled Introduction to Orthotics: A Clinical Reasoning & Problem-Solving Approach, 4th Edition. (Expected release date is December 10, 2014.) 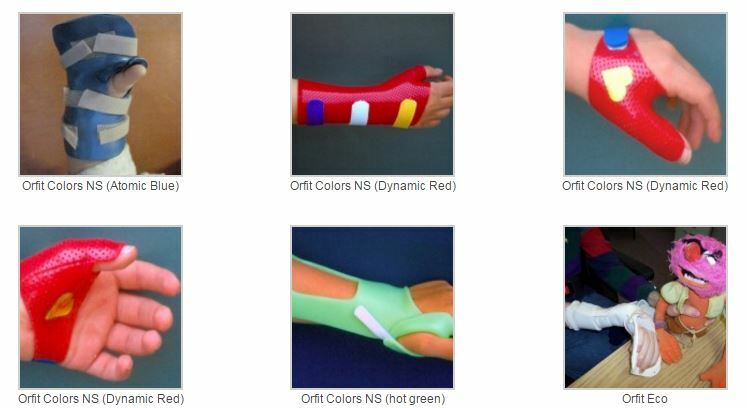 The chapter is interspersed with multiple photos of orthoses for children, most of them fabricated using Orfit Industries’ low temperature thermoplastic materials! Introduction to Orthotics is an excellent and practical resource for all occupational therapy practitioners and splint fabricators in clinical or educational settings. It features up-to date references, evidence-based research tables, orthotic patterns and how –to videos on orthotic fabrication. It is available for pre-order on popular websites like www.amazon.com. From static to dynamic orthoses, from short to long ones and even combined designs, the possibilities of Orficast More really are endless. Maryam Farzad PhD, OT and Debby Schwartz OTD, OTR/L, CHT share some of their best static and dynamic orthoses made with Orficast More. Before moulding any thermoplastic material on your patient’s hand, it is recommended and helpful to begin with a pattern. A pattern allows you to judge the correct amount of material needed for the specific orthosis and helps you to envision the shape and position of the finished product.